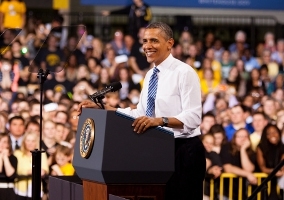 Last week on Wednesday, at 1:20 p.m., President Obama gave his planned speech at the University of Iowa, focusing specifically on student loan debt and the difficulties that attempting to afford higher education can cause for students. Obama addressed an overflowing crowd at the college's Field House, even though tickets still remained available to the public just the previous day. Both campus students and other community members were in attendance. The main focus of the President's address was student loan debt, as had already been announced, and it was almost word-for-word the same presentation the President gave via slow-jam on Jimmy Kimmel Live. The President suggested that he wants to do what he can to keep college affordable for students from many different financial backgrounds. He holds firm that everyone has the right to attend any college. The federal student loan interest rage is currently a 3.4%, which may not seem like a high number at all. It is still high enough in some cases to keep students in debt, though, and prevent them from making progress paying off loans. Obama spoke about his own personal experiences paying off college loan debt, which he and his wife only completed less than a decade ago. He has struggled with the issue of student loan debt himself, so it is a very important one to him on a more personal level. When Obama arrived earlier today, he prepared for his speech by taking the time for a sit-down talk with five University of Iowa student loan recipients about what they should expect to face upon graduating. The speech today was part of a very specifically aimed tour focusing on Obama's cry to Congress regarding student loan debt interest. He has visited three college in two days to speak on this issue.